In Dubai we had the chance to test the brand new Mercury Verado 400 R (which, of course, stands for Racing). Four of them on a Victory57 monohull, and we touched 71 mph. Or 61 knots. The main difference between the Mercury Verado 400R and the likewise new Mercury Verado 350, beside the 50HP, is that in many countries the former is not legal for pleasure navigation. The latter has the red line at 5800-6400 rpm, while the Racing can reach 7000.the weight is the same, while the cowling can be chosen in black or white, then further customized with different stickers (I won’t repeat myself about this…). The Sport Master gearcase has been specifically developed for the 400R and built with special components which can bear the increased power and speed. The final ratio is identical at 1,75:1, such as the three shaft lengths available: 508, 635 and 762 mm (20, 25, or 30 in). 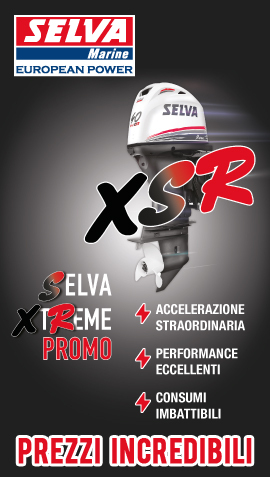 Differently from the Verado 350, on the 400R there’s the choice among three skegs. Mercury has developed also two specific propellers for the 400: Bravo I FS and ProMax, with the latter being more suitable to the single-engine mounts. As in every racing boat, the gear selector (neutral – forward – rear) is separated from the throttle levers, which use the DTS electronic standard for Mercury. The block, shared with the Verado 350, is an in-line six with 24 valves and supercharger, displacing just 2.6 liters for a total weight of 303 Kg.